Arlington, TX – The Dallas Wings announced today the team has acquired Washington Mystics guard Tayler Hill, along with the Mystics’ 2019 second round draft pick and the rights to swap 2019 first round picks in exchange for Aerial Powers. Originally a first round selection (4th overall) by the Mystics in the 2013 WNBA Draft, Hill has averaged 9.2 points per game in 134 career regular season outings, which included 55 starts. Hill recorded the best campaign of her career during the 2016 season when she averaged 15.4 points per game, including a career-best 26-point performance on August 28 of that year. A two-time selection to the All-Big Ten First Team and a three-time choice for the conference’s All-Defensive team, Hill was a four-year starter for the Ohio State Buckeyes and played alongside former WNBA first round draft picks Jantel Lavender and Samantha Prahalis. 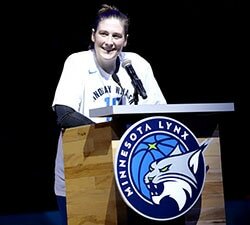 A native of Minneapolis, MN, Hill graduated as the state’s all-time leading scorer (boy or girl) with 3,888 points. 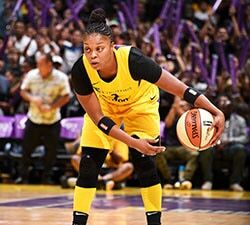 Washington, D.C. –Washington Mystics Head Coach and General Manager Mike Thibault announced today that the team has acquired Aerial Powers from the Dallas Wings in exchange for guard Tayler Hill and the team’s 2019 second round pick. Dallas will have the option to switch first round picks in 2019 based on Washington’s record. A 6’0 forward, Powers was selected in the first round (fifth overall) by the Wings. During her rookie year, she came off the bench and led the team in scoring in several games. Powers averaged 10.4 points per game, 2.7 rebounds per game and 1.1 assists per game on her way to being named to the WNBA All-Rookie team. After three seasons as a professional, Powers has averaged 9.4 points per game, 2.9 rebounds per game and 1.1 assists per game. Powers attended Michigan State University where she is the first player in school history to be named to the All-Big Ten First Team for three consecutive years. During her final year at MSU, she became the school’s all-time scoring leader with 1,817 career points. She also set other school records, including career points per game (18.9), double doubles (44) and free throws made (438). Hill was drafted in the first round (fourth overall) of the 2013 WNBA draft. 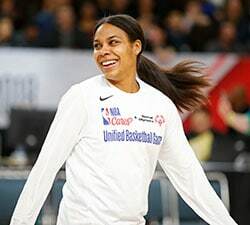 During her tenure with the Mystics, she helped the team to four playoff berths and had career averages of 9.2 points per game, 1.7 rebounds per game and 1.7 assists per game.